But let's recheck what happens if one diversifies by building in overseas equities, and small companies. Here the data is based on UK and US equity markets, for which there are good long term data sets. In each case we will assume rebalancing is done each year. Purely looking at the relative values of annual return and volatility, in the table above you can see that a different mix will offer either better returns or lower risk. Conclusion: Unless you know in advance which asset class is going to perform best - and you don't - diversify. It is your best chance of getting the highest return within any given risk profile. It is very clear to see, that is possible to fight back any benchmark figures: Higher RETURN & (!) lower Standard deviation! 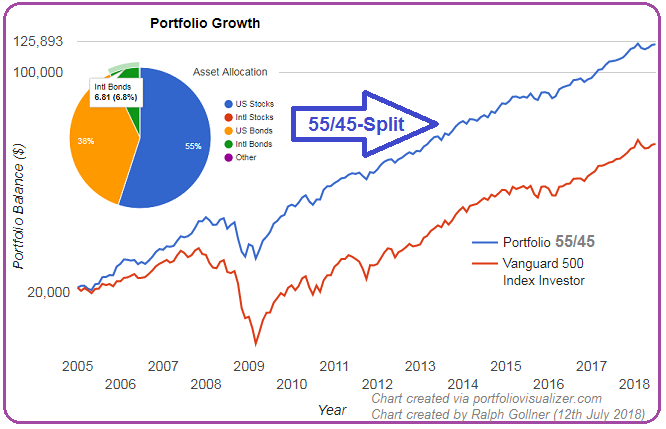 This has been done in the portfolio above via a 55 (stocks) / 45 (Bonds) - Split. The Backtest-Portfolio consists of 14 Stocks and a Bond-ETF. I am currently holding all 14 stocks in my Real-Portfolio, whereas I am only diversifiying by holding CASH or/and an EmergingMarkets-Bonds-ETF.